The term “bulldog” was first given to the breed in the 1500s. They were bred to fight bears and bulls. The bull, or bear, would be tied to a stake in an arena and the dog’s purpose was to take the beast down. One way they did this was by biting at the nose and never letting go. One feature that allowed these dogs to do their “job” was the overbite and short jaw. In fact, many of their features were bred into them to fight. This blood sport continued in many countries, including England. 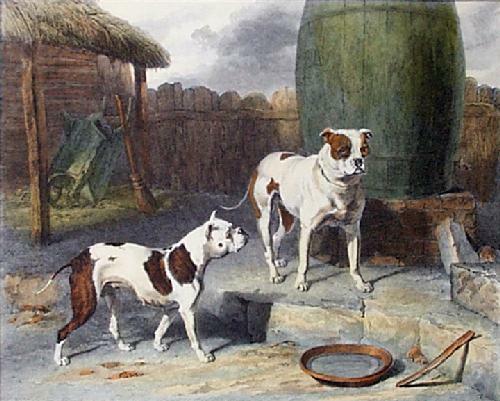 In 1835, the Cruelty to Animals Act passed in England. This made bear and bull baiting illegal. Soon after, many people had no use for these dogs anymore and the breed went almost into extinction. Dog breeders wanted to recreate the breed without the aggressive nature. They used the existing Olde English with other breeds; they ended up with the English bulldog. It is much different than an Olde English Bulldogge. The result is a breed that showed many health problems. In 1970, David Leavitt wanted to bring back the true breed from centuries before. With the help of a cattle breeding system, Leavitt was able to choose traits that were desirable. He wanted to keep the muscular and athletic qualities of the original bull baiting dogs. He used American, English bulldogs, American Pit Bull Terriers. 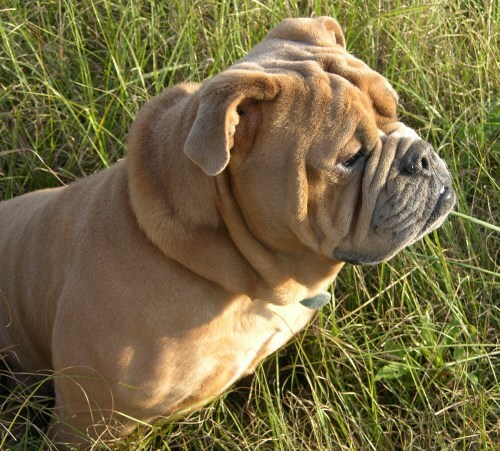 Mastiffs were also used to create the modern Olde English Bulldogge. OEBs and English bulldog’s differences go beyond health issues. 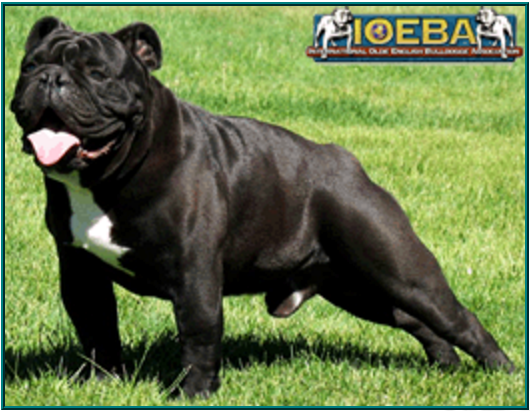 Olde English Bulldogges are taller than English and more athletic. They are agile and fluid in their movements, which is a trait from their ancestors. They also are more wrinkled in their facial skin than an English bulldog. Their bodies are sturdy, powerful, and well balanced. They can weigh anywhere from 50 to 80 pounds and stand less than 2 feet tall at the withers. They lack the overbite that English bulldogs have. Their skull is well proportioned to their bodies. Their expression may look frightening, owners of the Olde English Bulldogge know better. Their bulldog is loyal, friendly, and courageous. They are docile but if their humans or property become threatened, they are fearless and bold. Another personality trait of an OEB is their eagerness to please their humans. Make sure to keep plenty of hard bones and toys because they love to chew. The Olde English Bulldogge can come in a variety of coat colors. Black, blue, brindle and fawn, are just a few examples of coloration. Chocolate and red are other colors available also. They can also have white markings. There are many variations with any of those colors, such as black brindle or red brindle. Their coats are short and tight, much like all other bully breeds. Skin care is minimal with OEBs and baths should happen once a month. There are protective oils on the dog’s coat that help protect their sensitive skin. Brushing your dog every day will help remove any dead skin and dirt. As mentioned before, the OEBs health is much better than English bulldogs. They have become better breathers and are free breathers. They can have the same disorders as other bulldog breeds. Hip dysplasia is one of those disorders. Many breeders are taking precautions to keep the incidence of the disease down. Breeders are also doing their part by getting the dogs evaluated by reputable programs. Although not the most common of breeds, this bulldog is making more heads turn. Their beautiful coloration and their wrinkled snout make OEBs stand out from other breeds. Many who begin to look at other breeds often end up choosing and Olde English Bulldogge. Not aggressive anymore, this bully would be a lovable addition to any family.